Turns out you don’t need a container for snow. Seeing as it’s everywhere, The Long Dark simply treats it a ressource you always have in infinte quantities. Lucky for Lorrie I figured this out just in time, having settled her in front of a roaring let’s-all-die-of-thirst-in-oh-say-five-minutes fire. 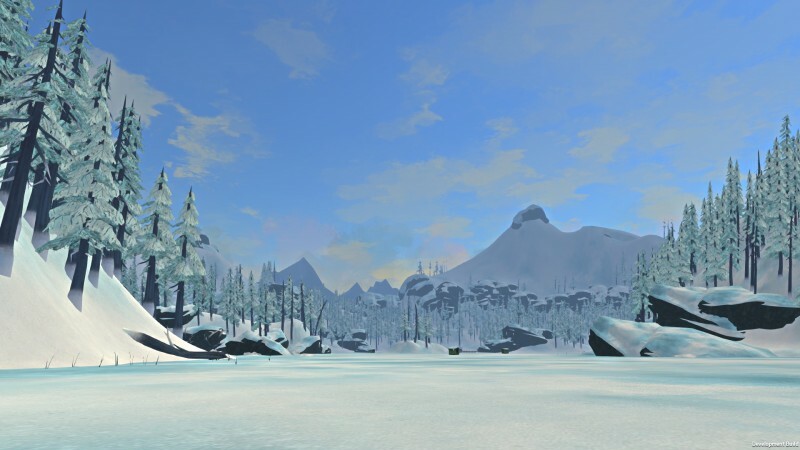 The Long Dark just launched for Linux/SteamOS and I just spent two hours surviving three days. And what three days they have been. Remember that time when we ate raw venison and got food poisoning because I was still figuring out the controls? What larks. And then when we ran out of water and were completely dehydrated and found a box of salty crackers? Man, Fate has a nasty sense of humour. Fortunately it also had stoved some carbonated beverages away in a cupboard for me or I wouldn’t have been able to swallow those crackers. Quite literally. 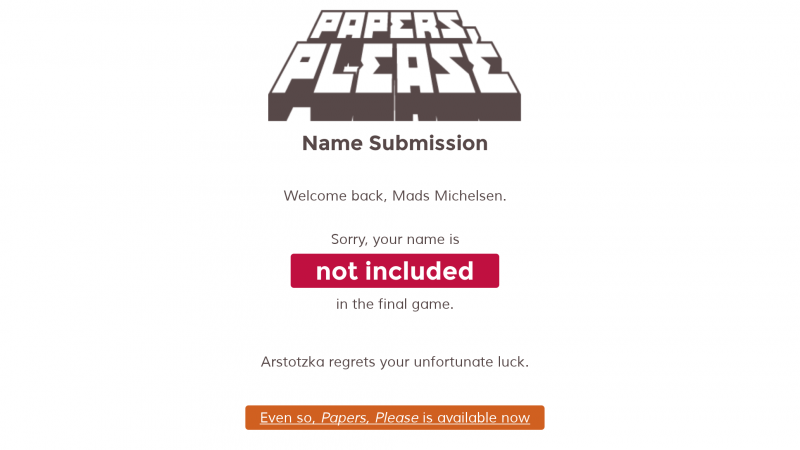 When Papers Please was still just a demo, that I played rather obsessively, Lukas Pope, the game’s developer, sent out a call for names. Enter your name in this form and maybe it would get included in the game. This was before all the accolades of 2013 would rain down on the game but I had a hunch this was something special. So I entered my name in the form and kinda forgot about it. Well, not quite. When I played the final game I would sometimes recall that submission and wonder if I might suddenly have to deny myself entry. Doing some housecleaning on a soon-to-be-abandoned Gmail account, I found the ‘receipt’ email from filling out the form. I clicked the link in it thinking that it would probably not work any more. Instead I got a metajoke from 2013. I guess it’s something. Better than getting deported. Why wasn’t my name included? A name may have been excluded if it was inappropriate for the setting, offensive, too long, too short, copyrighted, from an existing character, or simply not checked. Of 27,271 submitted names, I was able to check 20% (5,669) and only about half of those (2,705) were selected. Why not include all submitted names? My original intention was to include all submitted names but even a cursory check revealed a surprisingly vast number of inappropriate, copyrighted, offensive, not-theme-fitting, too-long, bad-joke names submitted by players. These kind of names can be fun but negatively affect the mood of the game. I decided the best move was to check each one manually. After nearly 6,000 names, I never want to see another fake Eastern European name again.